Naturally occurring layer silicate clay minerals can be value added by modifying their surface properties to enhance their efficacy in the remediation of environmental contaminants. Silicate clay minerals modified by the introduction of organic molecules into the mineral structure are known as organoclays and show much promise for environmental remediation applications. The present study assesses the extent of decrease in bioavailable and bioaccessible arsenic (As) via enhanced adsorption by soil treated with organoclays. Organoclays were prepared from hexadecyl trimethylammonium bromide (HDTMA) and Arquad® 2HT-75 (Arquad) at surfactant loadings equivalent to twice the cation exchange capacity (CEC) of an Australian bentonite and characterised by X-ray diffraction (XRD). Batch experiments were conducted to evaluate the adsorption of arsenate onto the organoclays from aqueous solutions. Encouraged by these results, the organoclays were applied to As-spiked soils, at 10% and 20% (w/w) rates, to assess their capacity to stabilise soil As. After 1 month of incubation in the laboratory, bioavailable (1 mM Ca(NO3)2 extractable) and bioaccessible (1 M glycine extractable) As from the spiked soils were assessed. Both the organobentonites effectively removed As from aqueous solutions. The adsorbent prepared with Arquad adsorbed 23% more As from aqueous phase than adsorbent prepared with HDTMA. Adsorption of As was controlled by anion exchange and electrostatic attraction. When applied to As-contaminated soils, the organoclays reduced the bioavailable As by as much as 81%. The extent of reduction of bioaccessible As was only up to 58%. The adsorbents were not as efficient in reducing bioaccessible As in contaminated soils as compared with bioavailable As. It could be attributed to the extreme pH condition (pH = 3) of the extractant used in the physiologically based extraction test method for assessing bioaccessibility. The greater the loading rate of organoclays, the better was the stabilisation of As in soils. Organobentonites prepared from HDTMA and Arquad at surfactant loadings greater than the CEC of the bentonite effectively remove As from aqueous solutions. Also, when applied to As-contaminated soils, both the organoclays reduce the bioavailability of soil As. The Arquad-modified bentonite performs better than HDTMA-modified bentonite. Data from this initial study can be used to further improve the stabilisation of soil As by using organoclays. Dr. Binoy Sarkar is thankful to the University of South Australia for the award of a University President Scholarship (UPS) and CRC CARE for Ph.D. fellowship. 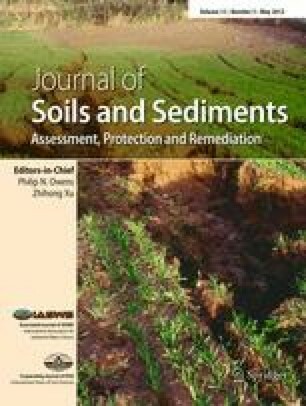 The authors would like to acknowledge the financial and infrastructural support from the Centre for Environmental Risk Assessment and Remediation (CERAR), University of South Australia. The authors would also like to thank Dr. Dane Lamb and Mr. Phil Thomas for their kind editing of the manuscript and two anonymous reviewers for their valuable suggestions to improve the quality of the manuscript.